A Rail is used for building a railway track for trains. Unlike transport belts, rail tracks can be also curved and placed diagonally. Train stops, rail signals and rail chain signals can be placed on rails to better guide automated trains. Gates can also be placed on rails, making them rail gates. The minimum rail turning radius is 12, meaning the smallest possible 180° turn is 24 tiles wide. The rail planner can be used to automatically place rails. See the page for more info. Rail planner tool simplifies rail building. Improved the rail selection logic. Halved the mining time of rails. Removed the curved rail, rail is the only type now. Increased the stack size of Straight Rails to 100 from 50. Gates built on rails now make them rail gates. Added end of track graphics. Rails are now crafted in pairs. 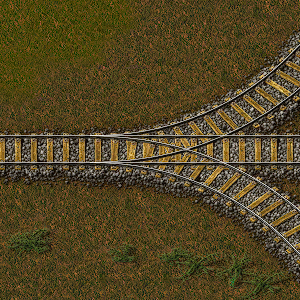 Nicer rail diagonals/turns on minimap. Added remnants for destroyed rails. Rails are not minable when a train is on them. Correction of bounding boxes of some built curved rails. This page was last edited on 17 April 2019, at 18:28.